I made a batch of this soup last weekend and froze half of it to have on hand for a quick lunch/dinner at a later time. This is a slightly modified version of a recipe I found years ago in Gourmet magazine. It is a hearty, satisfying and filling soup that goes great with corn bread, salad, grilled tortillas or a grilled cheese. 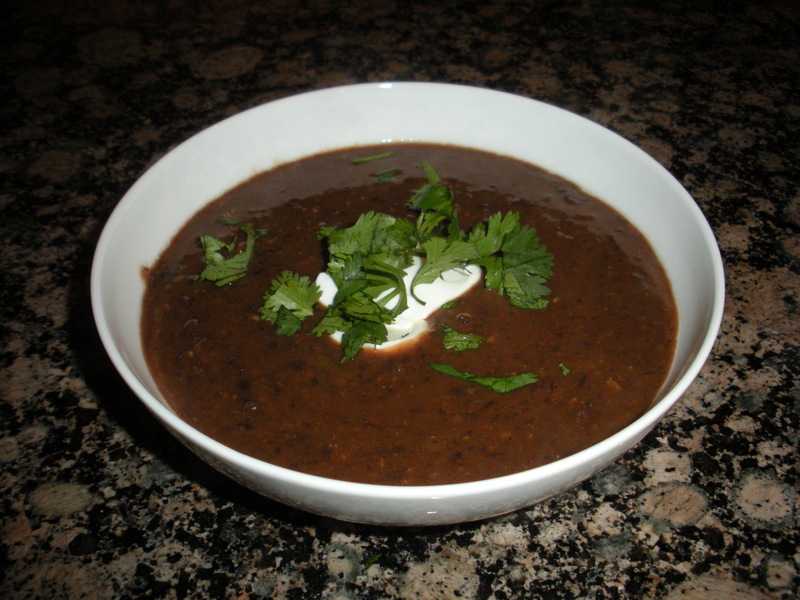 I prefer to use organic black beans as the sodium content is much lower than regular canned beans. 5 cans organic black beans, drained and rinsed. In a large dutch oven, heat a drizzle of olive oil and saute the chorizo until cooked through. Remove the chorizo from the pan and set aside. Add another drizzle of olive oil and saute the onion, pepper, cumin, crushed red pepper flakes and s/p (to taste), until the veggies are softened – about 10 min. Next add the garlic and cook for another 2 minutes. Add the beans and broth and simmer on low for 20 minutes. Taste and adjust the s/p as needed. Using a potato masher or hand blender, mash the beans to release some of the starch making a creamy texture. I prefer a rustic texture and therefore do not mix too much. Stir occasionally and continue to simmer uncovered, until the soup thickens and flavor develops – about another 30 minutes. Serve with sour cream and chopped cilantro.